Tom Lee, head of research at Fundstrat Global Advisors, on Thursday came out with a new informal poll indicating that the usually very cautious Wall Street investors are now overwhelmingly calling a bottom in the bitcoin market. 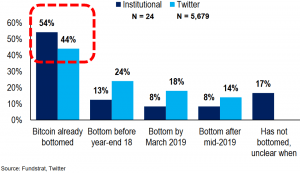 Twitter users, however, are still skeptical, with a majority saying bitcoin still has room to fall. 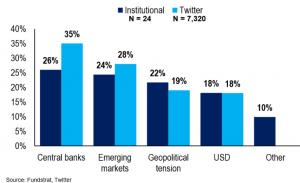 The firm had polled 25 financial institutions during a private dinner, and compared the results with 9,500 individual Twitter users. When and at what price will Bitcoin bottom? 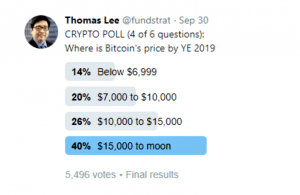 Among the institutions, 57% said they believe each bitcoin will be worth anywhere between USD 15,000 and “the moon” by the end of 2019. 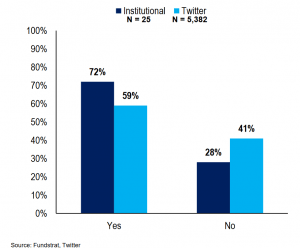 Among Twitter users, however, only 40% shared the same view. Where is Bitcoin's USD price by YE 2018 and YE 2019? 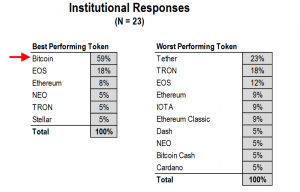 Fundstrat’s survey further revealed that 59% of institutions identified bitcoin (BTC) as their favorite coin out of 15 coins shown, while 46% of Twitter users said Ripple’s XRP was their favorite token. 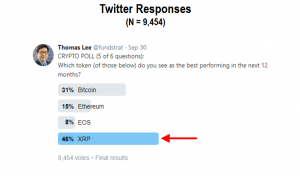 XRP, however, was also named the “most polarizing token” in the survey results, and no institutions chose it as their favorite. Which top 15 tokens will be the best and worst performing in 2019? Which of the 15 token's investment thesis makes the least sense? Further, the firm asked participants whether they believed cryptocurrency prices would rise during a recession. Important to note here is that a majority of the institutional respondents did not believe we will see a recession in the next 18 months. 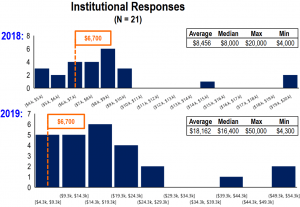 If a recession does happen, however, 72% of institutions polled believed that crypto prices would rise. Will cryptocurrency prices rise if there is a recession? 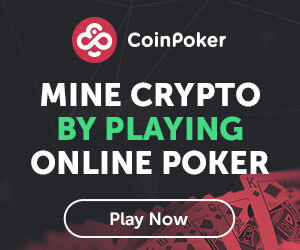 What is the most important macro factor influencing crypto prices? Some members of crypto community, such as Tone Vays, a trader and analyst, however, are not convinced, expressing the contrarian investment viewpoint that the majority is always wrong about market movements. In conclusion, the firm said bitcoin is likely to “meaningfully outperform” other coins on the market between now and year end 2019, given the institutional preference for the coin and the expected inflow of capital from new initiatives, including the upcoming Bakkt app. Meanwhile, former Wall Street banker and now-famous crypto bull Mike Novogratz, this week expressed a more cautiously optimistic view of the number one cryptocurrency, telling participants at the Economist Finance Disrupted seminar in New York that he does not believe bitcoin will break the USD 9,000 level this year. 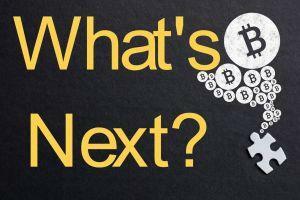 In comparison, a month ago, Tom Lee reaffirmed his USD 20,000 bitcoin price target for the end of the year. Overall, bitcoin prices have in recent months become less and less volatile, and have largely traded in a range between USD 6,000 and USD 8,000 since May of this year. Since early September, that range has become even tighter, keeping prices between the USD 6,200 and USD 6,800 levels, as the market is waiting for a breakout in the bitcoin price.